Jan Lambertus Deumens was born 17 September 1892 in Venlo, the Netherlands. He moved to The Hague, where he married Hendrika van Iersel in 1927. That same year the couple moved to the Dutch East Indies. Jan got a job as an accountant at a tax collector’s office in Weltevreden, Batavia. He was transferred several times, as usual in those days, first to Bandoeng, then to Semarang and Padang en finally back to Semarang, where he became adjunct-accountant 1st class. As most civil servants Deumens was called for duty in December 1941 and became a civic guard in Semarang. There he was taken prisoner-of-war (pow). He passed through several pow-camps on Java and ended up in Changi, Singapore. There he met draughtsman Henk Brouwer, who painted his portrait there. After the war Deumens worked as an accountant for the colonial government. From 1950-1953 he was head of the tax collector’s office in Makassar (Sulawesi/Celebes). Then he retired and went back to the Netherlands. He died in The Hague in 1983 at the age of 90. 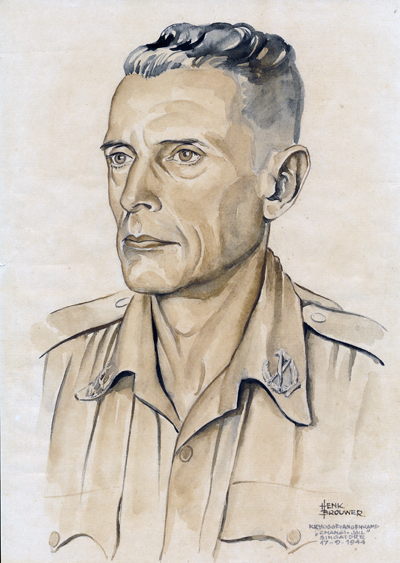 The portrait that Henk Brouwer made of Jan Deumens is dated 17 September 1944, the day Deumens became 52 years old. Was it perhaps a birthday gift of Henk Brouwer to his fellow prisoner-of-war Jan Deumens? We will never know. We do know that Jan securely kept the portrait and took it home after the war, where it hang on the wall. Early 2018 it was rediscovered by his granddaughter. Jan Deumens, like most POW’s, hardly ever spoke about his experiences during the war.